This year, escape the stress and musts of Christmas to the ethereal surroundings of ICEHOTEL, Sweden. Swap night life for northern lights, taxi rides for dog sledding through winter wonderland and hotel linens for reindeer fur and sleeping bags surrounded by ice art. 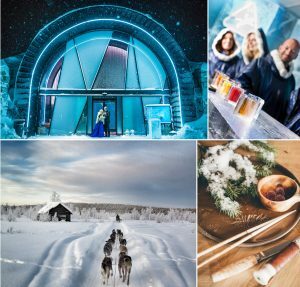 In its 29th rendition, ICEHOTEL opens the seasonal suites on 14 December, but Christmas celebrations starts already in November with the local village fair and traditional Christmas smorgasbord and fun winter adventures in the snow clad forests. But Christmas at ICEHOTEL is as much about winding down; enjoying a good read in the lounge over a cup of mulled wine, or the award-winning food served in one of the hotels’ three restaurant establishments. Mixing with locals who come to see the new suites in the hotel, a popular tradition in the days between Christmas and New Year’s Eve. If you’re lucky, you might catch a glimpse of the first wedding couple of the season as the Ceremony Hall is inaugurated in the end of December. Christmas markets: ICEHOTEL Dec 15-16. Jukkasjärvi village fair end of November. Christmas buffet at Jukkasjärvi Homestead. Fridays to Sundays from Nov 23. Book a table to secure your spot. The buffet is a classical Swedish Christmas smorgasbord with local delicacies like reindeer steak, roast beef of moose and herring buffet. Santa visits ICEHOTEL on Dec 24 & 25. Grand opening of the seasonal suites on Dec 14 and ICEHOTEL Ceremony Hall is happening on Dec 22. A dedicated and spiritual place for weddings and ceremonies in the seasonal ICEHOTEL. The design is made by Japanese artist couple Natsuki & Shingo Saito. Already have something planned for the holidays? Surprise a loved one with the Perfect Gift – an Arctic ICEHOTEL Experience. From 1 November until midnight on 25 Dec ICEHOTEL adds a complimentary 15% value to all Perfect Christmas Gift Cards when you order online. They come with a complimentary copy of the awarded ICEHOTEL guide publication and a glossy A4 print with a personal greeting of your choice. New Year’s Eve at ICEHOTEL is different. Leave the heels at home – the dress code for New Years at ICEBAR BY ICEHOTEL is snow suit and moon boots. The evening starts with a specially composed New Year’s dinner at Icehotel Restaurant. For the stroke of midnight, make your way down to the frozen Torne River and marvel at the hundreds of lanterns slowly rising towards the sky. The party goes on until late in ICEBAR BY ICEHOTEL. Sip cocktails ”in the rocks” from glasses made of ice and dance the night away under the ice chandeliers with locals and travelers from all corners of the world. Nearest airport is Kiruna, serviced by SAS Scandinavian Airlines and Norwegian via Stockholm (90 min flight).